I knew that the Roberto Bolle and Friends Gala Tuesday at New York’s City Center would be a popular event when I walked past the long line of people waiting in the ticket reserve line. Those waiting were not disappointed as the evening featured a diversity of dancing from Roberto and his friends, many from German ballet companies. The evening consisted of 11 unrelated pieces ranging from modern to classical, of which Roberto danced in four. The evening opened with a pas de deux from the full-length ballet Excelsior. I don’t know much about the ballet; it is a tribute to the scientific and industrial progress of the 19th century, from the electric light to the telegraph, steam engine, and Suez Canal, according to Wikipedia. Roberto was in skimpy attire (basically a decorated dance belt) while Alina Somova from the Mariinsky Theatre wore a more traditional white ballet dress. The partnering section was fairly short followed by solos featuring fine, controlled jetés, sauté de basques, and coupe jetés from Roberto. Somova ha a turn section consisting of single and double fouettés and she made it through the section. Well danced but not my favorite performance of the evening. Excelsior was followed by the Act I Romeo and Juliet pas de deux with Alicia Amatriain and Jason Reilly of the Stuttgart Ballet. 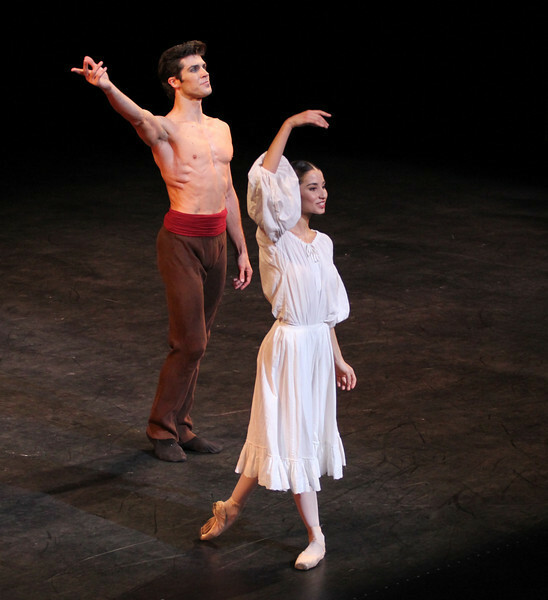 It was clear that they have partnered together as young, star-crossed lovers in this Cranko (Stuttgart Ballet) version. Filled with emotion and brimming with excitement, the two lovers proclaimed their everlasting love. I’ve always liked Luciana Paris at American Ballet Theatre (ABT) and would like to see her dance more; happy to see that she is one of Roberto’s friends, paired up with another favorite, Herman Cornejo in Twyla Tharp’s Sinatra Suite. She always excels in this role at ABT along with another Tharp piece “In the Upper Room.” Not sure why she does not get more exposure, but that is a topic for another day. Herman was dashing, debonair in a black tuxedo with Luciana in an elegant black gown as they danced to Sinatra favorites such as “Strangers in the Night” and “My Way.” In “Strangers in the Night,” Herman tossed off his jacket with a look of indifference and defiance. In another section, he pulled off seven jazz turns effortlessly. In my favorite part, he danced in an intoxicated manner as Sinatra sings “one more for the road.” Sinatra Suite was a great selection for the evening and the audience roared with approval. Elisa Carrillo Cabrera and Mikhail Kaniskin of Staatsballet Berlin danced in Jeunehomme. This piece, choreographed by Uwe Scholz, was set to music by Mozart. This was a contemporary piece with the dancers are dressed in black. Cabrera and Kaniskin were precise in their intricate movements with Cabrera showing great extension. Their characters seemed frustrated as they were missing and longing for something. Near the end, he walked off the stage, and she was lost without him. He reappeared at the end and they embraced. I liked this piece with difficult partnering sequences, one of my favorites of the night. My least favorite was Le Grand Pas de Deux with Roberto and Alicia Amatriain of the Stuttgart Ballet. This was a silly, stupid, and a pointless comedy piece in which Amatriain walked down the aisle in the beginning on her way to the stage wearing glasses and toting a purse. Roberto was in a Nutcracker type costume. It was classical ballet interspersed with disco. In one section, Alicia completed a very good series of fouettés only to stagger around stage on the verge of vomiting while Roberto was working on a turn section in second position. Not sure why this was put in the program but some in the audience were amused. Roberto and Erika Gaudenzi, listed in the program as a Young Italian Talent, Opera House, Rome, opened the second part of the evening with a dramatic pas de deux from L’Arlesienne. I am not familiar with the ballet so it was difficult to follow what was going on. He seemed disturbed about something and then removed his shirt. This was a recurring theme in the evening as the men more often than not were shirtless, showing off their toned bodies. Roberto danced a long introspective, wandering solo that was very well done. Kazimir’s Colours with Elisa Carrillo Cabrera and Mikhail Kaniskin were next, set to music by Shostakovich. The music was particularly memorable and dramatic, set to this contemporary piece, with the dancers wearing gym attire. When I arrived, I immediately focused in eager anticipation of the Tchaikovsky Pas de Deux by Balanchine with Herman Cornejo and Maria Kochetkova of the San Francisco Ballet. Maria danced with Herman in Swan Lake and Sleeping Beauty, filling in for the injured Alina Cojocaru in the ABT spring season. They make a nice pair, as she is shorter than Herman and light as a feather. Notable parts were Herman’s massive double cabriole derrière, high leaps, entrechat six, double assembles, and double tours to the knee. She was very fast in her spunky solo with a jumping arabesque on releve and very rapid turns and fouettés. She was a very proficient turner. Next was a very interesting modern piece, Mona Lisa with Alicia Amatriain and Jason Reilly opening with creaky doors and fog. (The last time I saw fog at City Center was for ABT’s In the Upper Room. That evening, a zealous stagehand in charge of dry ice pumped massive amounts of fog onto the stage, obscuring all of the dancers. After about 10 minutes with screaming from the audience, the curtain closed and the ballet was restarted after the fog lifted.) Rather than me describing it, take a look at this Youtube clip. A very entertaining 8 minutes. What would a gala be like without the Dying Swan, choreographed by Fokine? Alina Somova was the unfortunate swan, dancing in beautiful Russian form. Last was Prototype, a solo for Roberto by Massimiliano Volpini. A large video screen lined the back of the stage with computer-related images of a human body (ultimately Roberto’s) and modern techno-type music. The screen then showed various high-tech images with Roberto interacting with the screen, dancing in unison with the images. At one point, the screen showed examples of ballet steps, which Roberto replicated. Off for a costume change into skin-colored trunks. The theme then turned to classical as he danced to Romeo and Juliet and Swan Lake. Off for another costume change into jeans and a jean jacket so he could dance with images of multiple Robertos on the screen. The interplay with Roberto and the images was unique, revealing his great technique and diversity. Roberto was joined on stage by the dancers to a well-deserved rousing ovation by the appreciative, full-house crowd.